So- today, John and I met my family in downtown D.C. to grab some lunch and catch a matinee show. Lunch was great (we went to Famous Luigi's for pizza), the show on the other hand was a different story. I love all things Christmas. My family and I are known to rock out to the Transiberian Orchestra and Mannheim Steamroller each and every holiday season. As a result, when we found out they were coming to the Verizon center, we had to go. The show was set to start at 3 pm. It didn't kick off until about 3:20 pm. No biggie, aside from the fact that heat most certainly rises (and if I didn't realize it before, I definitely do now). I wore a dress, knee high suede boots and tights (i.e. not a bulky sweater and wool pants) and I think even my hair was sweating. The first song opened and I was a little nervous. The lighting (strobe) and pyrotechnics made feel as though someone slipped a tab of acid in my pizza. 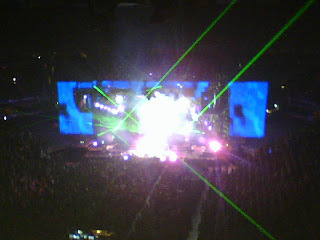 Think the Pink Floyd laser light show with cellos and violins. My mother was tripping out so bad that she had to wear sunglasses throughout the entire show. The first hour of the show was fabulous. We were bopping our heads along with the band, having a great time. Then the show kept going, and going, and going. In fact, they didn't stop singing (nor did they take an intermission) until after 6 pm. Two hours and forty minutes of orchestra. One would think that even the biggest fans would grow sick of it in that time frame. Not so my friends, not so. The lead guitarist kept yelling out the the crowd, "would you like to hear a few more songs?" My sister and I could barely lift our heads (damn, heat exhaustion) enough to roll our eyes at each other and whisper please, no. God, no. But no, the orchestra lovers yipped and yelped and were elated to hear another 3 songs. After that, he came back on to announce several more. Gag me. On the way home I decided that perhaps orchestras are not for me. I'm much happier listening to the C.D. in the comfort of my own home and will continue to do so every holiday season from here on out.